Highly potent COX1/2 inhibitor (IC50 values are 19 and 54 nM for COX1 and 2 respectively). Non-steroidal anti-inflammatory drug (NSAID). Blood-brain barrier permeable. Our Abpromise guarantee covers the use of ab141035 in the following tested applications. DU145 cells were incubated at 37°C for 40h with vehicle control (0 µM) and different concentrations of (S)-Ketoprofen (ab141035) in DMSO. Decreased expression of pro-caspase 8 (ab49853) correlates with an increase in (S)-Ketoprofen concentration, as described in literature. Whole cell lysates were prepared with RIPA buffer (containing protease inhibitors and sodium orthovanadate), 10 µg of each were loaded on the gel and the WB was run under reducing conditions. After transfer the membrane was blocked for an hour using 5% BSA before being incubated with ab49853 at 1 μg/ml and ab8227 at 1 μg/ml overnight at 4°C. 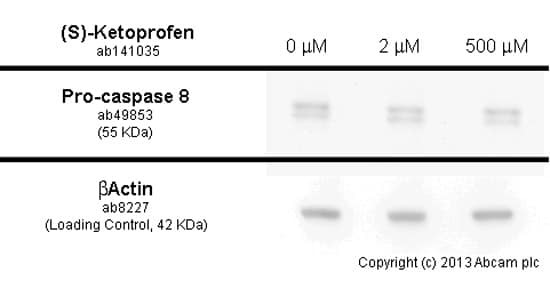 Antibody binding was detected using an anti-rabbit antibody conjugated to HRP (ab97051) at 1/10000 dilution and visualised using ECL development solution. Publishing research using ab141035? Please let us know so that we can cite the reference in this datasheet. There are currently no Customer reviews or Questions for ab141035.